Everyone in your business needs the efficiency of the KONICA MINOLTA PagePro? 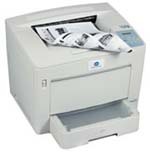 9100 N network laser printer. From built-in electronic document collation for your sales team, to razor-sharp 1200 x 1200 dpi resolution for your marketing group, to its low price for your finance department, the PagePro 9100 N provides the best investment you can make in network printing productivity. At 35 pages per minute and support for pages up to 11'x17', the PagePro 9100 N delivers the right combination of print speed and page size support for all business printing needs. The PagePro 9100 N includes a high-speed, 10/100BaseTX Ethernet interface providing seamless access to everyone on the team. The PagePro 9100 N has a paper input capacity of up to 2,200 sheets of paper and includes a multipurpose tray that is very useful when printing labels, envelopes, transparencies, and heavier paper stocks. A 250 MHz MIPS R5000 CPU powers Crown III multitasking. While the PagePro 9100 N prints one document, it continues processing others. Five, ten, or even a hundred sets of that report without even leaving your desk? Electronic collation combined with an optional 4-bin mailbox makes multiple document set production effortless. CrownView provides all the information you need about the printer right from your desktop through your favorite web browser. An automatic duplexer option for two-sided printing reduces paper costs and filing storage requirements. Full paper jam recovery ? even for different documents from different people ? provides easier unattended printing. High resolution 1200 x 1200 dpi printing delivers crisp type, smooth images, and fine lines. Strong enough for up to 150,000 prints per month in just about any type of network environment, the PagePro 9100 N is the departmental printer you can rely on.